TURNS ANY FIRE INTO A UNIQUE FIRE SHOW OF COLORFUL FLAMES! ORDER TODAY & GET FREE SHIPPING ON ORDERS OVER $50 DOLLARS!!! Turns Your Backyard Fire Into Magical Colors. Take Us Camping. Simple To Use. No Mess. Turns any fire into a frenzy of color! Throw or sprinkle into fire to give that overall colored flame appeal. Great for larger areas of flames. 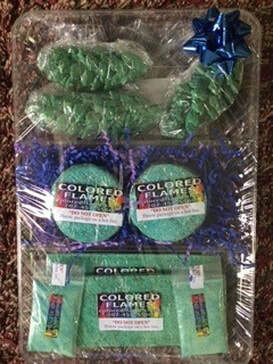 ​Available individually, 10 packets or 50 packets of FAMOUS Colored Flames dust. ​colors. ​Definitely made the night time fun! Turns any fire into a frenzy of color with our Colored Flames pucks. Just toss a puck into your fire and watch the colors as they dance around! ​This "Deluxe Assortment" is Loaded!!! Comes with 2 wood Cedar Bars, over 15 Maine Colored Flames coated Pinecones, & our specialty roll, this arrangement also contains a couple pucks, 4 packets of our dust, the wood stick all wrapped together in a bowl, finished with a bow!! Perfect for gift giving or a family/friend get together!! For Only 49.99, it's a bargain!! 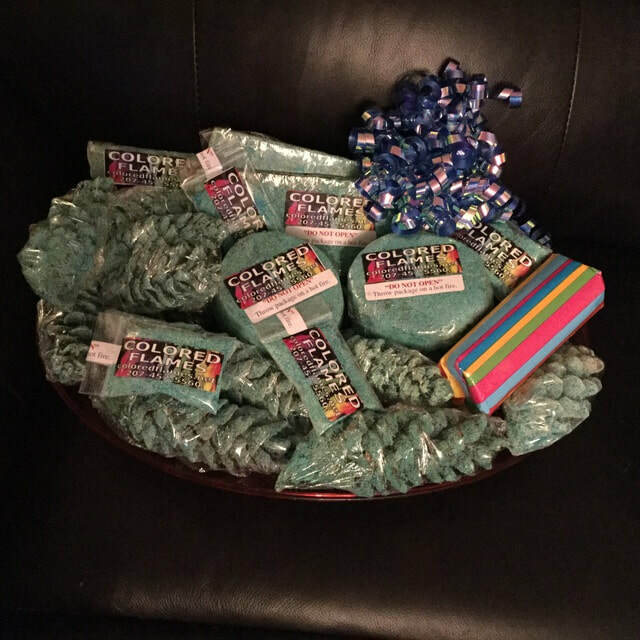 Burn time: Over 15 hours of amazing colors!!! mesmerized by all of the different colors in the flames!!! Superchunks are 8" long and made of wood and coated with our Colored Flames dust. 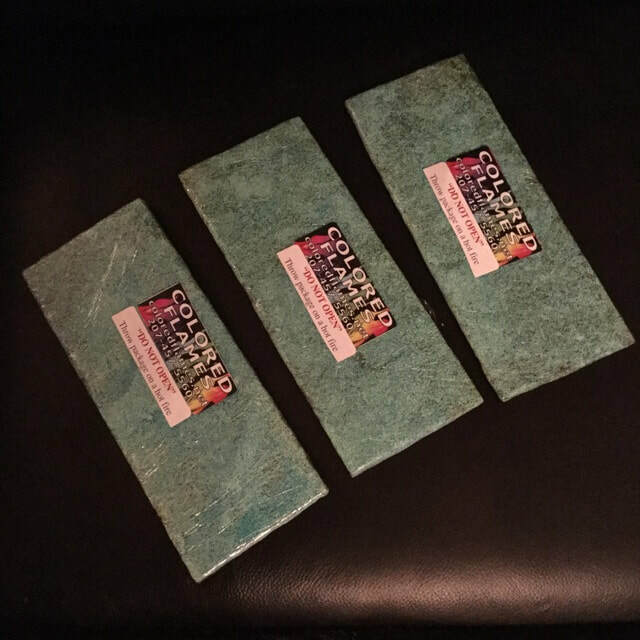 Each Superchunk has 2 routered grooves which are filled with our amazing Color dust! These easy to use and create beautiful colors. ​This set makes a great gift for those "hard to buy for" people in our lives. asking us where we got them! Great fun! ​Our Best Seller! Toss each pine cone into the fire and let the fire show begin! 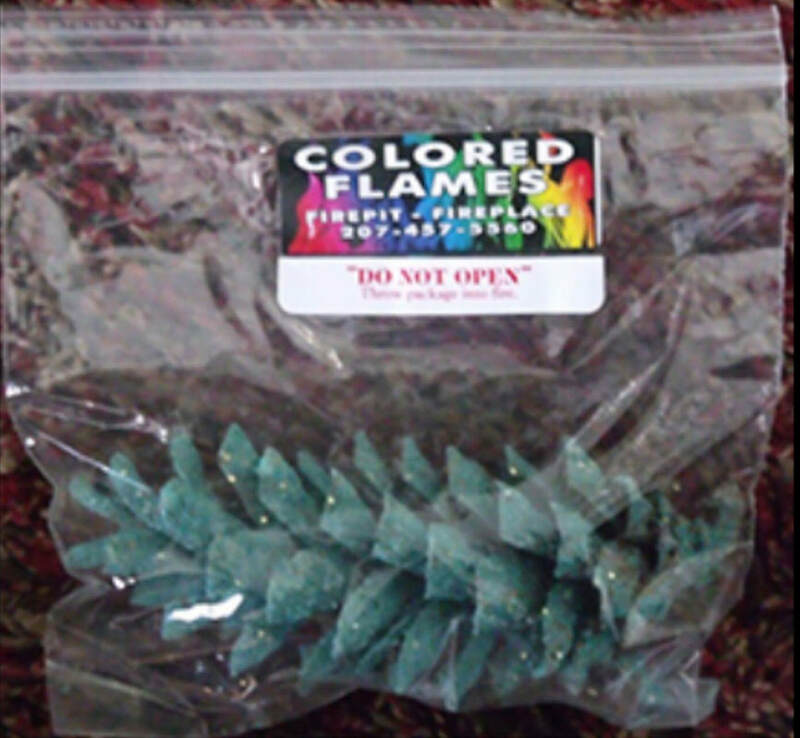 Great for gifts!​ Includes 10 Colored Flames pine cones with basket. ​This clear "Pine Cone Bowl" holds over a dozen Maine Pine Cones and includes a BONUS packet of our Colored Flames fire dust! Each Pine Cone has been coated in our colored dust and will burn beautiful purples, teals, blue green, white and bugundy colors! Very relaxing! Makes a GREAT gift! ​A camping favorite! Toss each Colored Flames Roll into the fire and let the fire show begin! 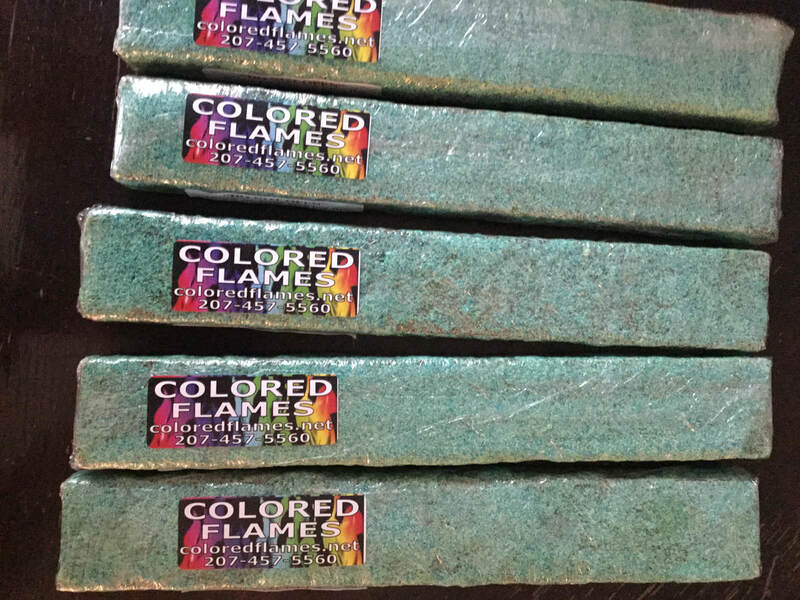 ​Colored Flames 13" wood log is a must for Bonfires, weddings, parties & gifts! Our wood log lasts approximately 4 hours of beautiful colors and is fully coated in our Colored Flames dust!!! Our logs are found and hand carried out of the Maine woods, routered with 2 long grooves that is filled with more of our Color changing dust!! 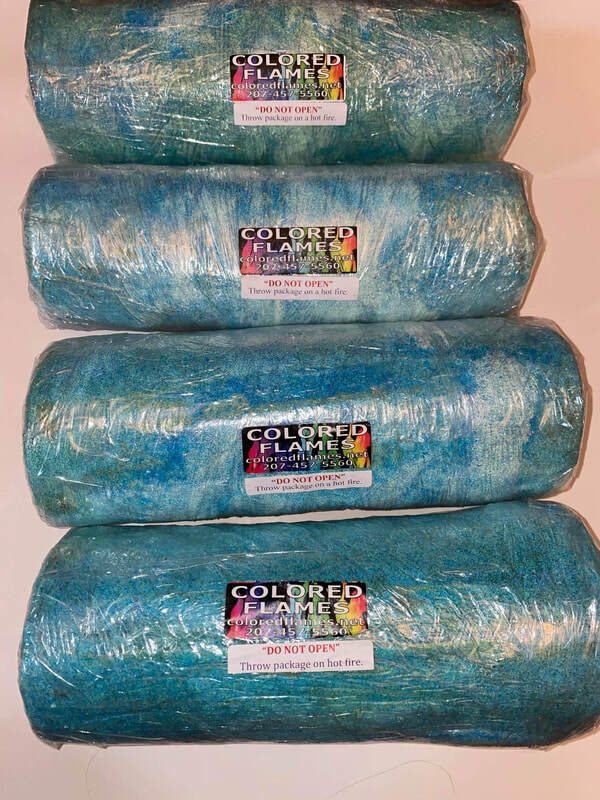 ​Package of 5 Colored Flames logs ready to turn any fire into an amazing experience that your family and friends will remember forever! 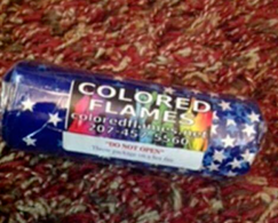 Our Colored Flames logs are 13" long X 5" diameter and each logs burns for up to 4 hours! Great for all fires, including bonfires! We get these every year for our Christmas Party to burn in our fireplace! They are just amazing and our guests look ​forward to them now. 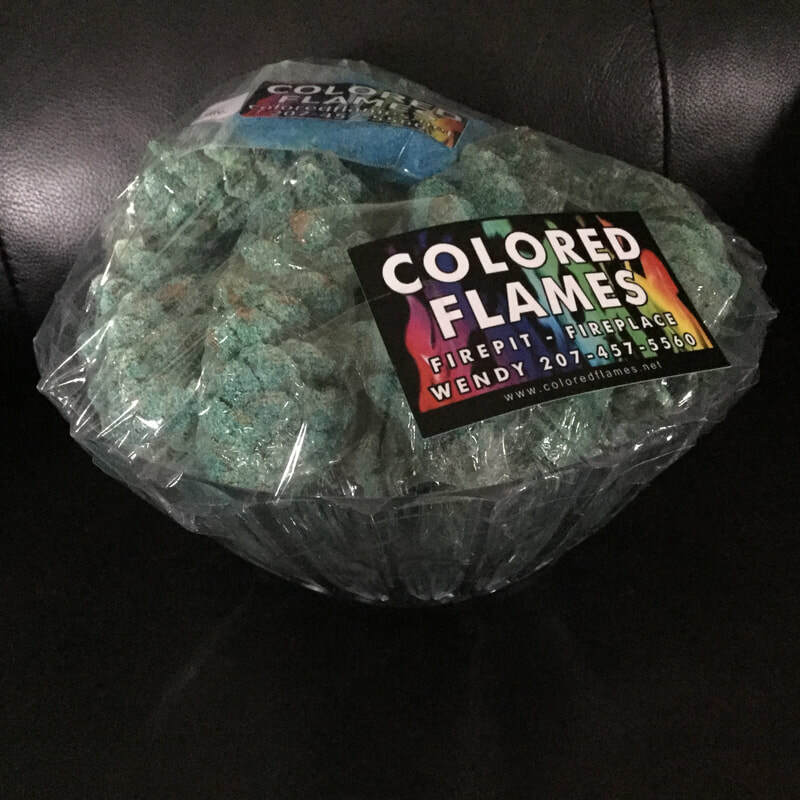 ​This bucket of Colored Flames holds approximately 20 pine cones and includes 2 packettes! Great to take on that camping trip or use in your bonfire! Bucket included! ​Excellent for Bonfires! Great Money Saver! Perfect for July 4th Festivities! Best Value! Includes Two Superchunks!! Five Maine Pine cones!! 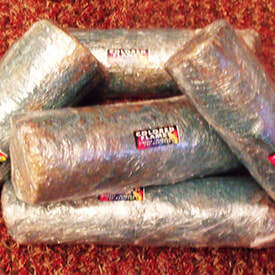 Ten Wood Cedar Bars, not a couple but SIX Wood Pucks and four packets of our FAMOUS Colored Flames Dust!! All for $79.99 & Yes, shipping and handling is included! Burn time: Over 20 hours of colored flames! of our tradition. Who needs fireworks! ​Over 10 hours of colored flames burn time!!! This set makes a great gift for those "hard to buy for" people in our lives. Packed with colored flames dust packets, pine cones, magic wands a small roll, a large roll, pucks and cedar flames bars. Burn time: Approximately 40 minutes to 1 hour (per item) over 10 hours worth of burn time! Product not for use with electric stoves. 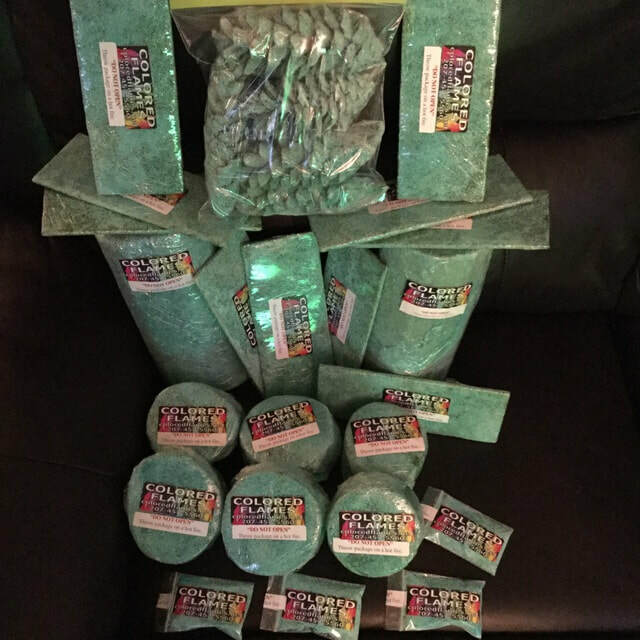 "Got some of the logs for our camping trip and couldn't believe the amazing colors! The kids had so much fun!" "All of the colors were so wonderful we could have stared at the fire all night!"